Extreme Drought: Weather Variance or Climate Change? The San Antonio Missions National Historic Park is located in a unique ecological area that includes three types of ecosystems.The Edwards Plateau, Oak Woods and Tallgrass Prairie, and Tamaulipan Thornscrub ecosystems meet in the city. The conjunction of this variety of ecosystems plus the presence of numerous streams and associated riparian vegetation offer support for a diversity of plants, animals, and ecological environments that characterize the San Antonio River Valley. This image shows remnants of a Spanish mission acequia, an irrigation ditch still in operation. 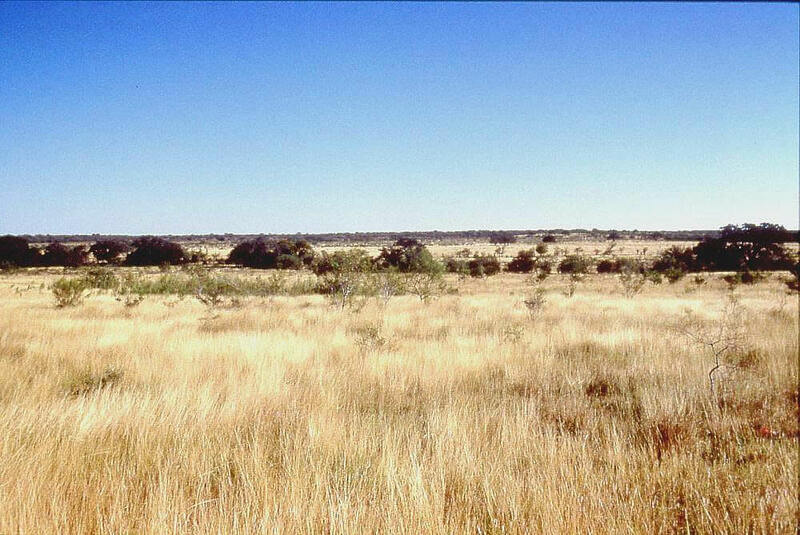 Much of the land in and around the San Antonio National Park is referred to as "disturbed lands," or areas that have been engineered for human habitat. The process of human engineering of the land and water in the San Antonio River Valley dates back to two Spanish missionary settlements between 1718 and 1720 and another three Spanish missions in 1731. Human reconfiguring of the land continued through the 1950s when, for example, the San Antonio River was channelized near the park to assist with flood protection. Today, human engineering of the San Antonio River Valley continues and is necessary to provide water to support San Antonio's growing population. Human changes to the historic San Antonio missions area has been ongoing since the creation of the national park in 1978 to support historic preservation of the area. The park has acquired many acres of property to restore the landscape and protect cultural resources. Much of this land was occupied by modern homesteads in various stages of use and was heavily disturbed. The park has restored most of the areas by removing buildings and debris in an attempt to recreate the landscape of the Spanish colonial period and also to meet modern health and safety standards. Before the introduction of sheep, goats, and cattle, the upland areas of the Lower Pecos Canyonlands had extensive grasslands like this restored area. During wet climatic intervals the grasslands flourished, and herds of buffalo migrated into the area. Photo by Phil Dering. Many of today's plowed fields and old fields (succeeding to huisache tree uplands) are located where historic labores (fields) were tended during Spanish colonial times. Areas with the historic acequias were at one time dry scrublands. Because of water provided by acequias irrigation systems (historically engineered canals that carry snow runoff or river water to distant fields), thick riparian vegetation with tall trees have replaced scrublands in some areas. However, drought conditions in 2011 turned parts of Texas and the Plains into a parched moonscape of cracked earth. According to an Aug. 5, 2011, Associated Press story, the drought "could persist into next year, prolonging the misery of farmers and ranchers who have endured a dry spell that is now expected to be the state's worst since the 1950s." As the image to the left illustrates, during the summer of 2011, higher than normal temperatures and dry vegetation combined with high winds and low humidity led to extreme drought conditions in Texas, Oklahoma, New Mexico, and parts of Arizona, Colorado, Nebraska, and Louisiana. Your task is to determine whether these drought conditions are a consequence of global climate change, or are these conditions more likely normal seasonal weather patterns for this area? Should Texas and other states in the Great Plains plan for long-term drier weather and higher temperatures? Or will the weather return to more temperate conditions with varying higher and lower seasonal temperatures and precipitation levels? In carrying out your task, consider whether human interventions to the waterways and landscape play a role in exaggerating ecology changes. The National Park Service is interested in your analysis of this situation because your research results (causes and consequences) might apply to other ecological areas across the country. The developing rubrics page in the Problem Based Learning section provides a content-specific rubric for the Drought module under the Sample Rubrics heading. The following activity can be used to help your students learn how they can use NASA satellite data resources to solve the problem-based learning task presented. Image courtesy NOAA Paleo Slide Sets. Purpose: To utilize monthly average precipitation data to strengthen conclusions about periods of drought or abnormal rainfall from analysis of tree rings. Locate, access, and utilize data sets to support a selected physical phenomenon. Import data into Excel and produce an appropriate graph of that data. • How have average temperatures in Texas changed over the last 100 years? • How has the San Antonio area water availability and demand changed over the past 100 years? 4d: Scientific observations indicate that global climate has changed in the past, is changing now, and will change in the future. The magnitude and direction of this change are not the same at all locations on Earth. Engage in the process of science—asking questions. (G) Organize, analyze, evaluate, make inferences, and predict trends from data. Identify possible models, hypotheses, ideas, or hunches. LS2.C: Ecosystem Dynamics, Functioning, and Resilience. (7) Science concepts. The student knows the relationship between carrying capacity and changes in populations and ecosystems. The student is expected to: (A) relate carrying capacity to population dynamics. Understand how satellite maps, remote sensing, and GIS tools can be used to study Earth’s lithosphere, biosphere, hydrosphere, and atmosphere. (F) Use a wide variety of additional course apparatuses, equipment, techniques, and procedures as appropriate, such as satellite imagery and other remote sensing data, Geographic information systems (GIS), global positioning system (GPS), scientific probes, microscopes, telescopes, modern video and image libraries, weather stations, fossil and rock kits, bar magnets, coiled springs, wave simulators, tectonic plate models, and planetary globes. Understand the processes of natural selection, including how populations adapt to local conditions over generations. 3E. Life—including microbes, plants, and animals and humans—is a major driver of the global carbon cycle and can influence global climate by modifying the chemical makeup of the atmosphere. The geologic record shows that life has significantly altered the atmosphere during Earth’s history. Earth science, basic level: Use knowledge of biogeochemical cycles to predict how an ecosystem may change due to pollutant or change in land use, and propose methods to lessen negative impact on ecosystems. (A) Systems…Change and constancy occur in Earth's system and can be observed, measured as patterns and cycles, and described or presented in models used to predict how Earth's system changes over time. Understand the relationship between atmospheric moisture (precipitable water) and precipitation. 4.C. Climate change is a significant and persistent change in an area’s average climate conditions or their extremes. Seasonal variations and multiyear cycles (for example, the El Niño Southern Oscillation) that produce warm, cool, wet, or dry periods across different regions are a natural part of climate variability. They do not represent climate change. • Use weather data to identify major weather events. • Describe the processes of the water cycle, including changes in the physical state of water. • Explain the factors that affect regional climates. (K) Communicate valid conclusions supported by the data through methods such as lab reports, labeled drawings, graphic organizers, journals, summaries, oral reports, and technology-based reports. (3) Scientific processes. The student uses critical thinking, scientific reasoning, and problem solving to make informed decisions within and outside the classroom. The student is expected to: (A) in all fields of science, analyze, evaluate, and critique scientific explanations by using empirical evidence, logical reasoning, and experimental and observational testing, including examining all sides of scientific evidence of those scientific explanations so as to encourage critical thinking by the student. Analyze data to identify regional trends occurring in precipitation and to be able to explain results and present recommendations for solutions at the local level based on evidence. 3.D. d. A range of natural records shows that the last 10,000 years have been an unusually stable period in Earth’s climate history. Modern human societies developed during this time. The agricultural, economic, and transportation systems we rely upon are vulnerable if the climate changes significantly. • Analyze reliability of data, using scientific models to explain results, and choosing among alternative conclusions based on arguments from evidence. (E) Demonstrate the use of course equipment, techniques, and procedures, including computers and web-based computer applications. • Learn that climate is the long-term average of weather at a given location. • Local climates can be classified into different general categories. • Measurements are subject to uncertainties. • Relate historical perspectives to global climate change research. 2. A. Earth’s climate is influenced by interactions involving the sun, ocean, atmosphere, clouds, ice, land, and life. Climate varies by region as a result of local differences in these interactions. 4. B. Climate is not the same thing as weather. Weather is the minute-by-minute variable condition of the atmosphere on a local scale. Climate is a conceptual description of an area’s average weather conditions and the extent to which those conditions vary over long time intervals. • Cite evidence and identify scientific tradeoffs among energy sources. • Analyze conflicting claims about scientific evidence related to water resource issues such as groundwater contamination and effects of stream channelization, levees, or dams on flood control and flood plains. (C) Relevance. The interacting components of Earth's system change by both natural and human-influenced processes. Natural processes include hazards such as flooding, earthquakes, volcanoes, hurricanes, meteorite impacts, and climate change. Some human-influenced processes such as pollution and nonsustainable use of Earth's natural resources may damage Earth's system. Examples include climate change, soil erosion, air and water pollution, and biodiversity loss. The time scale of these changes and their impact on human society must be understood to make wise decisions concerning the use of the land, water, air, and natural resources. Proper stewardship of Earth will prevent unnecessary degradation and destruction of Earth's subsystems and diminish detrimental impacts to individuals and society. Students investigate and understand that energy transfer between the sun and the Earth and its atmosphere drives weather and climate on Earth. Key concepts include weather phenomena and the factors that affect climate including radiation and convection. Use scientific data to support a position regarding possible causes for the 2011 summer drought conditions in Texas using scientific evidence to support your position. 1.B. When Earth emits the same amount of energy as it absorbs, its energy budget is in balance, and its average temperature remains stable. Use the U.S. Drought Monitor to investigate drought conditions in the nation overall, by regions, or by state..
Drought and Heat Create Hazardous Fire Conditions in Texas: Uses satellite data from NASATerra-MODIS satellite. Drought in Texas: Satellite sensors measured the amount of leafy green plant matter at the surface. Brown colors depict places where plants were less leafy or more sparse than normal, while better-than-normal conditions are green. In mid-April plants throughout the state showed clear signals of drought stress. Use this web resource from NOAA to provide evidence of historical perspectives to global climate change research. North American Drought: A Paleo Perspective and guided access to Instrumental Records of Drought for the United States go back more than 10,000 years. Student work will be evaluated based on an agreed-upon rubric or other rating system that can be applied to papers, projects, presentations, or project development activities. San Antonio, TX. Left: June 16, 1991. Right: June 4, 2010. NOTE: Maps displaying state and regional drought conditions are also available on this interactive web site: http://droughtmonitor.unl.edu/. The U.S. drought monitor is also included in the Featured Data section of the Drought module. Use this tool to obtain real-time global climate monitoring products and assessments of the origins of climate anomalies. For example, as of September 2008, you can view or download analysis of precipitation that covers a 30-year period from 1979 and is updated on a quasi real-time basis. Global gauge daily precipitation analysis is part of the NOAA Climate Prediction Center (CPC) Unified Precipitation Products Suite. The daily gauge analysis is created on a 0.5-degree lat/lon over the global land by interpolating gauge observations from ~30,000 stations. What does the Jan. 5, 2011, precipitation map tell you about precipitation across the United States versus South America? The gauge-based daily precipitation analysis is constructed for applications in climate monitoring, climate analysis, and verifications of numerical models and satellite estimates. The Climate Time Machine is a color-coded interactive map (at right, in image format; below, as a direct link to the Flash animation) that shows a progression of changing global surface temperatures from 1885 to 2007. Dark blue indicates areas cooler than average. Dark red indicates areas warmer than average. (Credit: NASA/Goddard Scientific Visualization Studio). What does the Climate Time Machine tell you about your state's temperatures during this 122-year period? Use Google Earth to explore the areas in Texas and bordering states that have been most affected by the drought. Some of the data resources accessible via this Google Earth customized map include: (1) Aquifer well depth data tables and graphs; (2) photos of wildlife with the latitude and longitude locations of sitings and comments by naturalists (see sample photo below); and (3) embedded links to featured locations such as national parks. The image above shows the latest three-month average temperature and precipitation anomalies for the United States for the years 1950-1995 compared with Jan. to March 2005. Image Credit: NOAA. 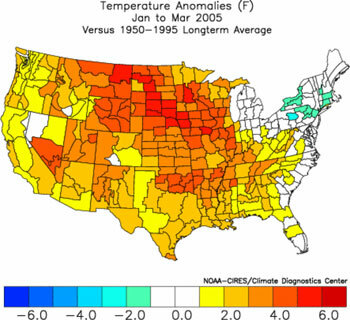 What does this map tell you about temperature anomalies for Texas in 2005 versus 1950-1995?